We support you as an HR Manager by providing this polite Vacation Leave or Annual Leave refusal letter template, which will help you to draft a personalized version and send to your employee directly who needs to receive a confirmation on the vacation leave request. Introduce a flexible work solution or leave on a later time. 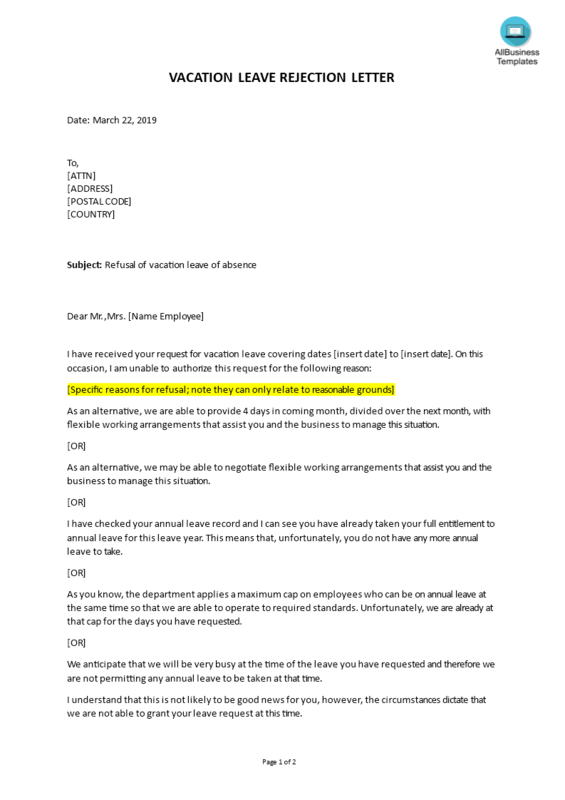 This Vacation Leave Not Approved letter has ways to grab your staffs' attention. It is drafted by HR professionals, intelligently structured and easy-to-navigate through. Pay close attention to the most downloaded HR templates that fit your needs. Download this Vacation Leave request refusal letter template now!